Crafting Queen: Floral Fantasy - Quilled Gift Tags! Floral Fantasy - Quilled Gift Tags! Its been long i posted something and so am back with a big bang. Last month has been quite busy with me both professionally and personally. 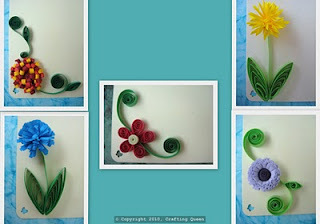 My Quilling and card making is going beyond just a hobby now and i had few orders to work on. Thanks to my encouraging friends and others who sent me orders. I have done loads in the last month and would be updating the same soon. As for now here are a set of 5 quilled gift tags with various types of flower patterns.... aptly called the Floral Fantasy. These are now on sale ,please check out my page on Facebook - Crafting Queen for more details. shoooo.. beautiful.. really very neat..
nice choice of colours . I mean to quill a peacock someday .yours is an inspiration.